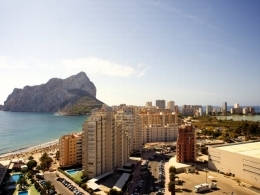 Luxury three bedroom Penthouse/Duplex for sale with open views in Javea only two minutes walk from the sandy beaches of Javea and its Restaurants and Shops. Walking distance to the Port and an easy drive to the Spanish Old Town. With a lift to the main door, the penthouse has approx 130m2 build distributed over two floors, with the first floor enjoying a spacious Kitchen, Lounge and dining area, two double bedrooms, bathroom. All doors lead onto the front terrace to enjoy the panoramic hillside views. An interior staircase, takes you to the main bedroom with a gallery, ideal for a dressing area, and en suite bathroom Exceptionally large rooftop terrace where you can enjoy more views. Air conditioning throughout and refurbished in 2016 Garage parking and storage. This property should be viewed by clients looking to downsize and be nearer to facilities. The terraces are ideal for clients enjoying the outdoor living and entertaining.